Are you interested in making the leap into Professional Food Photography? Are you a professional commercial or wedding photographer now, and want to expand into food photography, but don’t feel confident enough to make the jump? Maybe you just need to understand food photography lighting a little better or maybe you’d like to talk about the business with someone who’s been there. If so, maybe this workshop is for you? I can teach you the secrets and subtleties of food photography lighting so that you feel more confident about making professional quality images on demand. I can teach you about how to get amazing texture out of your food shots. Lighting is the key, and I can teach you all my tricks. I’ve been a food photographer for many years now and besides my love for food photography, I’ve discovered that I also have a love for teaching. Besides my blogging about food photography, I’ve been asked on several occasions, if I offer individual training. The answer is yes. For a few years now, I’ve been conducting one-on-one workshops, and now I’ve decided to devote a little more time to these workshops. One of the many nice things about doing a one-person food photography workshop is that I don’t need to gear it to the “least common denominator” student. I can gear it to exactly what YOU need to learn. To accomplish that, I interview YOU before hand, to find out what YOUR interests are. I listen to what YOU want to learn and then I look at YOUR work to see what I think YOU need to learn. Then, I build a custom workshop to fit YOUR exact needs. It’s all about YOU! If you want to talk about lighting, that’s great. If you want to talk about business or marketing, that’s great too. Your workshop is tailored exactly to your wants and your needs. Just a warning here… These workshops are not for everyone. Having an interest in food photography isn’t enough. This isn’t food photography 101. It is strictly ADVANCED food photography. The workshop is totally geared toward the already professional or almost professional photographer. I’m not interested in teaching the basics of photography. That doesn’t appeal to me at all. I enjoy teaching people about the subtle things that take a food photographer from the intermediate lever to the advanced level. This workshop is perfect for the wedding photographer or the commercial wishing to expand their services into the food photography industry. It’s also good for recent photography school graduates that want to go on to learn from someone that specializes in food photography. This would also be food for an experienced food blogger than wants to take their photography to the next level. The truth is, I haven’t found any other place to learn advanced food photography. There are lots of online courses, seminars, workshops, and classes available for people wanting to learn basic food photography, but none are available for advanced food photography. Where does this one-on-one workshop take place? My studio is located in Pittsburgh, PA USA, and most of my workshops are conducted in my studio, but I am willing to travel to your location. If we do this at my studio, you’ll get to see all my food photography toys and gadgets, but if I come to you, I’ll be able to assess your environment and make suggestions about needed equipment and facility changes. Me coming to you also has the added benefit of reducing your time away from work. The investment of the workshop may be more easily justified if you can still work the days before and after the workshop, instead of spending them traveling. To schedule these workshops, all we need to do is compare calendars and come up with a date. I’ts that easy. I can schedule to do these on a weekend or a weekday. It doesn’t matter to me. If you decide you want to come to Pittsburgh for the workshop, I’ll give you the address of a hotel only blocks away from my studio and blocks away from downtown Pittsburgh. You won’t even need to rent a car. Just take a cab in from the airport to your hotel. I can pick you up at your hotel the morning of the workshop and drop you off at the end of the day. The current cost for this one-on-one workshop is $1350.00 (one day) and $2100.00 (two day). This includes a full day of instruction, lunches and transportation to and from your hotel. If you’d like me to come to you, I would need to charge for travel expenses (air, hotel, ground transportation), including $600.00/day travel fee. If you think you might be interested in this workshop, send me an email and we can start a discussion. I started my career as an in-house photographer for a graphic Design Firm. From there I went on to work for a catalog house in Chicago. After that I came back to Pittsburgh to start my own business as a commercial photographer. That’s when I discovered my attraction to food photography. While I still like shooting a variety of subject matter, my greatest photographic love is food photography. Pittsburgh isn’t a huge city, but still I’ve been able to attract quite a few big names clients including Heinz, Del Monte, Rich’s Products, Ruth’s Chris, Friday’s, and many others. See the menu item on the left of this page to see a more complete client list. If you have any questions about this one-on-one food photography workshop, you can email me or call me at 412-232-4444. I attended Michael Ray’s Food Photography Lighting Seminar/Workshop in September of 2010. To say it expanded my knowledge and confidence for food photography lighting would be an understatement. I’ve taken other lighting seminars but Michael’s workshop had immediate applications to my photographic needs. I was shown the equipment and techniques that enabled me produce beautiful photographs back in my studio. The tips and tricks I learned from Michael allowed me to solve lighting problems and go on to create my own personal lighting style. If you can take only one food photography lighting seminar, make it Michael Ray’s. “I recently did a one on one, one day seminar with Michael. Michael is a talented photographer with a willingness to share his techniques and experience. His understanding of lighting is incredible. I saw and learned techniques that were completely new way to look at lighting. The techniques are applicable to all forms of photography – from Food to Product to Fashion(!). His concepts of “Light Layering” and “Light Scraping” and his process are unique. My name is Jessica Uttinger, and I shoot food photography for a local gourmet grocer in Dayton, Ohio. I recently took a workshop with Michael Ray, along with one of my co-workers, and I have only good things to say! Michael’s knowledge of lighting is vast and he isn’t shy about sharing that knowledge. He was very generous with his own trade secrets, which truly make his work stand out among competition. Before the workshop, I would stare at his photos and wonder how on earth he was achieving certain lighting techniques. During the workshop he taught us those exact techniques and I’m confidently using them back at my home studio! Michael is also a phenomenal teacher. He has a great sense of humor and is very patient. We spent two days mentoring with him, and I was sad to leave as I felt I’d made a friend. I’m so thankful to have had the opportunity to learn from such a leader in the field of food photography, and I hope our paths cross again one day! 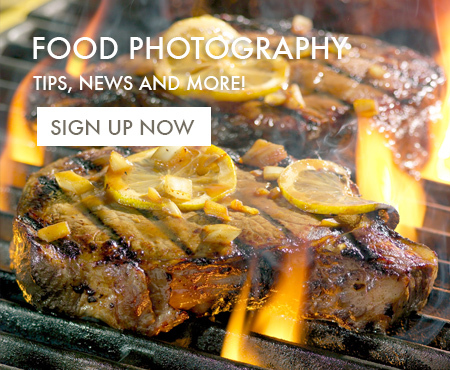 I highly recommend this workshop to any food photographer looking to enhance their skills. After spending two days with Michael Ray Photography, we walked away knowing that the quality and design of our food photography was going to increase substantially. During our workshop, he provided one-on-one instruction and used our time to cater to very specific needs we had expressed. He coached us on new, different techniques he uses to create his own images, and helped us recreate similar effects to apply in our home studio. Working for a small chain of gourmet grocers in Ohio, we’re confronted with many challenges and limitations on a daily basis. We presented these to Michael and he used his unique breadth of knowledge to individually address each circumstance. Michael is experienced and passionate about all things related to Food Photography, and we left with a similar fervor to apply what we had learned to our own photos. I am interest in your one or two days class. I like to learn about the business of food photography, pricing and managing project. Getting and working with stylist with fee or testing. Technique on quality lighting and setting up. Shooting for client and for myself. I am graphics designer with photography experience. I like to learn from someone that done it before. Thanks for your consideration. I look forward to meet you in person and exchange ideas.